Join us to celebrate Kathina Day by offering robes and requisites to the Sangha. Robes can be purchased in the temple on the actual day. This entry was posted in Sunday Morning Service (SMS) and tagged Kathina Day, Offering of robes on September 28, 2014 by wayadmin. This entry was posted in Sunday Morning Service (SMS) and tagged Dhamma talk, SMS, Sunday Service on September 26, 2014 by wayadmin. 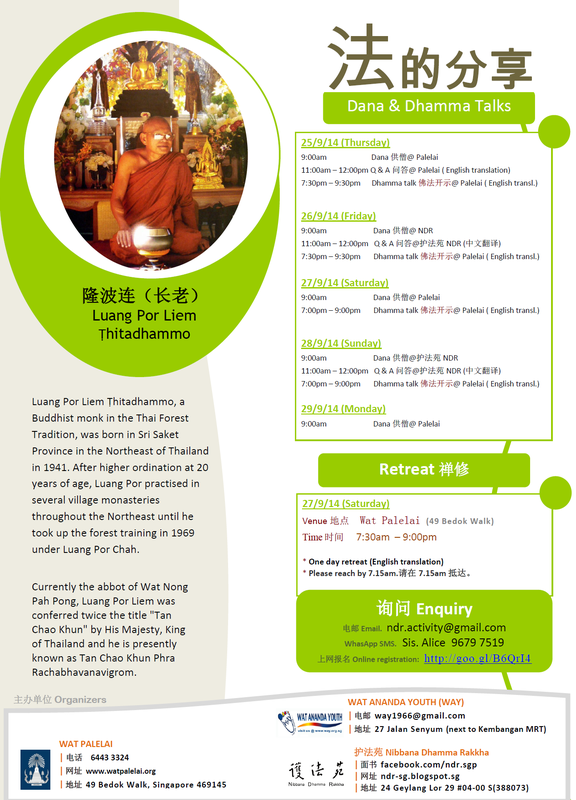 Luang Por Liem Thitadhammo, a Buddhist monk in the Thai Forest Tradition, will be in Singapore from 25 to 29 Sep 2014. Luang Por practised in several village monasteries throughout the Northeast Thailand until he took up the forest training in 1969 under Luang Por Chah. Pls click on title of this post to view the enlarged poster for details of the talks and dana opportunities in Wat Palelai and NDR. 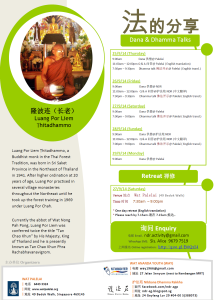 This entry was posted in Forest Way and tagged Dana, Dhamma talk, Luang Por Liem on September 5, 2014 by wayadmin.